We saw these blooming last May at the Ruth Bancroft Gardens in Walnut Grove, California. The flowers are unbelievable. They are not just turquoise, they are METALLIC turquoise! They looked surreal. No mammals caught in the spines but I did notice, far back in the clump, an old shoe that would have fit a small child. Ha! 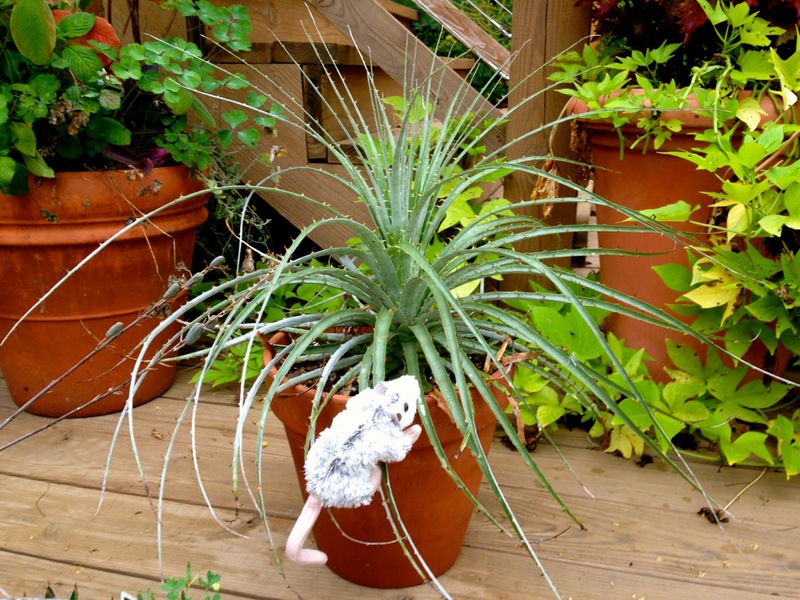 The plants we think will never survive…… Pootie might outlive you! Happy to note that dangerous stuffed possum has been stopped in its tracks, whew. So true – that’s what makes gardening an adventure! Possum now back in the toy basket. Squeaker intact. I do fear for the other 42 squirrels, chipmunks, and tennis balls. Next Next post: Why doesn’t my plant look like it did last year?